CURRIMUNDI....Yoga Nidra is the most profound rest there is. 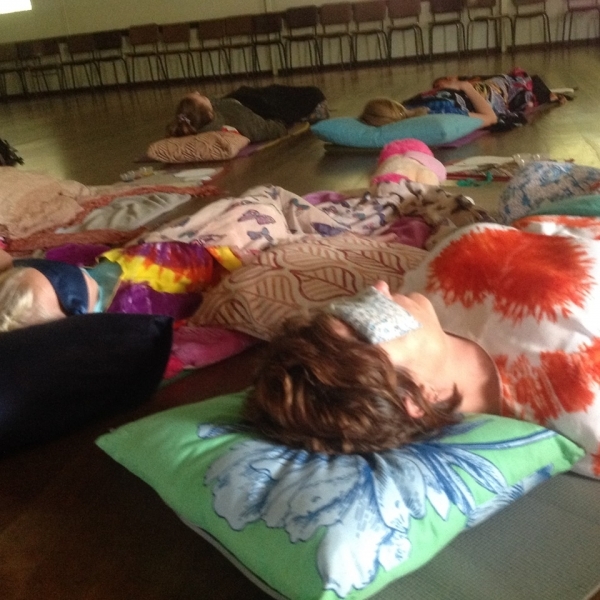 Yoga Nidra is an accessible practice available in some form to almost everyone. The practice takes place lying down. It requires no special skills, other than to follow the instructions which consist of a systematic process for complete relaxation of body and mind by taking the awareness to different aspects of experiences such as breath, sense awareness, parts of the body and different layers of mental awareness. Gradually all tension in the body and mind is released in a careful and deliberate way that creates profound relaxation. The intention (sankalpa) or affirmation, which is part of yoga nidra, allows us to shape our own future (steer your life in the direction we want to go rather than where our habits tend to take us). The practice creates a profound release from the mind's entanglement in the sensory world. The effect creates energy and a freshness in body and mind. During a 45 minute guided meditation session, facilitated by Anna. All you need to do is rest on your mat with a pillow and blanket and use your breath, body and awareness techniques to help you move into progressive states of relaxation and eventually resting in stillness. Anna is an internationally certified yoga nidra facilitator (Amrit Institute) and trained by Kamini Desai, author of 'Yoga Nidra. The Art of Transformational Sleep'). Anna is a Member of Yoga Australia and part-time Kindergarten teacher on the Sunshine Coast. Anna became interested in the health benefits of Meditation and Yoga Nidra during her yoga teacher training in an effort to assist with her own health issues including menopausal hot flushes (which have now reduced from 20 a day to maybe 1 or 2). She is one of the few Facilitators on the Sunshine Coast and uses watercolour painting after as a form of Meditation Creation using paints from Germany. Anna was a presenter at 2018 YogaFest Sunshine Coast, 2018 Noosa Yoga Festival and 2018 Noosa Regional Art Gallery 'Imaginate' Festival. Enq. Anna 0431 873 042 txt or phone to book a mat space please. BRING A PILLOW AND BLANKET please.